This video blew me away with a very cool, simple method for separating eggs that's a lot less messier than the old "crack it onto your fingers" approach. Not sure if I'll ever use it, but that in no way detracts from its awesomeness. Don't worry if you've misplaced your babel fish-- the video is self-explanatory. There are a number of interesting observations to be made from this list. Of the top 15 recipes, 4 are cookies, and 7-9 are sweet (depending on how you categorize pancakes and crepes). Carrot cake is the only cake in the list, beating out chocolate cakes, cheesecakes, and other classics that you might expect to be more popular. Given the presence of carrot cake, it's no surprise that cream cheese frosting follows right behind. Crepes at #7? Really? That many people make crepes at home? I find that very difficult to believe. I'm betting the sugar cookies are so high because everyone goes looking for a recipe at Christmas. Does anyone actually like sugar cookies? Given the world of cookies to choose from, would those be your first choice to eat, or are they more of an arts and crafts project with the kids? Chewy chocolate chip cookies, however, are relevant to my interests, so I may just try the #8 recipe. #14, however, looks very similar to Alton Brown's Chewy, which is my goto champion in the genre (although I see that the recipe on Food Network's site has been changed to use weights instead of volumes). A taste test may be in order. The recipe at #5 is pretty much this: put water, cream of mushroom soup, dry onion soup mix, and a pot roast into a slow cooker. Really? That's the best pot roast recipe we've got? Correction, it's the most-viewed one, not necessarily the best-tasting. But the reviews for this are positively euphoric. I admit I'm a bit of a kitchen snob and the idea of using condensed soup instead of "real" ingredients disturbs me, but I'll admit you can't beat the convenience. The chicken pot pie recipe at #9, on the other hand, looks pretty reasonable. I may well give that one a try, substituting a homemade crust. Overall, it's clear what the AllRecipes community values most: convenience. So the #1 recipe is a bit of a surprise, since it requires a slow-cooked sauce and doesn't use no-bake noodles. When the weather cools off (which, given this is Seattle, could be tomorrow) I'll definitely want to try this one out. If anyone out there decides to give any of these recipes a spin, please report back with your results. When it comes to macaroni and cheese, there are two kinds of people in the world: those who reach for the blue box, and those who reach for the orange box. I've always been an orange boxer. I can't recall ever seeing the blue Kraft Mac & Cheese box in our house when I was growing up, but there were always two Stouffer's products in our freezer: french bread pizza and mac & cheese. Kraft's version seems like a product that tends to grab people in their childhood. The shockingly bright powder that becomes a gooey cheese sauce on the stovetop feels too artificial to my adult taste. But the contents of that orange Stouffer's box-- fluffy, creamy, with a fabulously browned cheesy crust-- is my Platonic ideal for this dish. I've tried making baked mac and cheese from scratch a couple of times, but the recipes-- from Alton Brown and Cook's Illustrated, each of whom has produced big winners for me in the past-- left me flat. The results lacked flavor and the unctuous body I was looking for. I always thought that the big choice with mac and cheese is stovetop vs. oven. But yesterday I discovered one even more important: bechamel vs. custard. Bechamel, made by whisking scalded milk into a flour-butter roux, is one of the five French mother sauces and a basic component of dishes like lasagna, moussaka, and many casseroles. Custard is a cooked mixture of milk/cream and egg, and can become the foundation of anything from pastry cream to quiche. The recipes I hadn't liked started with a bechamel. But now that I thought about it... the Stouffer's mac certainly had the qualities of a custard. Could this be the answer I've been looking for? Yesterday I put together this recipe from Saveur Magazine (just look at that photo! ), whose story on macaroni and cheese educated me about the bechamel-versus-custard debate in the first place. And aside from an absurdly low quantity of pasta in the recipe-- next time, I'll increase the pasta by at least fifty percent, because there's ample sauce to handle it-- it turned out splendidly. The custard gave the dish exactly the kind of body I'd been looking for, and the hint of onion elevated it even further. I intend to try the Artisanal recipe soon (since the Bellevue outpost of that restaurant just closed yesterday, I lost my chance to just walk in and order it), but for now this custard-based mac and cheese is my new comfort food favorite. I don't part with money easily. Generally, this isn't a problem for my lifestyle-- I have very few real needs. I don't drink, I don't need the latest tech toys, and Lord knows I don't care about fashion. While I do make a couple of trips to San Francisco each year for puzzle events, I don't galavant around the world. I don't go to concerts (unless you're dancing in the aisles, I don't see the point-- and I don't dance in the aisles). An old car gets me there just as well as a new one. Really, there are very few things I want to buy in the first place. I enjoy food. I like reading about it, I like making it, and I like eating it. Food makes me happy. But even so, I don't like dropping a big wad of cash on a meal. Food is ephemeral. When a dinner is over, you've got nothing to show for it but extra inches. Are the memories of a great meal worth the money you pay for it? I read about the Great Restaurants of our time. I see their chefs on television. And it boggles my mind that such restaurants, where $100 is only the beginning of a meal, are able to sustain themselves. Who is their clientele? Outside of Hollywood and Wall Street, are there people who go out to eat at such places on a regular basis? Who are these people? How much more than me do they earn? Or do they make even less than I do, but run up their credit cards and leave nothing in their bank accounts? Are they living for today, where I'm living for tomorrow? Or do they just have expense accounts? I always have buyers' remorse after an expensive restaurant meal, especially one where the price is for artistry and doesn't necessarily result in leaving fully sated. My wife and I are in Vegas for our babymoon-- a last trip together before the baby arrives and shackles us to hearth and home. We're here because she wanted to go someplace warm and sit by a pool to relax. I love Vegas. I love the energy of the place, the way the Strip comes alive at night with throngs of people, flashes of neon, and a palpable sense of fun waiting to happen. But this town is built for one thing: separating you from your money. The only question is whether you're going to give it away in the casino or exact some measure of trade for it elsewhere. As far as I'm concerned, this trip is all about her. Couples like to say "we're pregnant," but really-- she's doing all the heavy lifting. I'm just around to, well, keep her from needing to lift anything else. So last night I took her to dinner at the restaurant of her favorite Top Chef Masters chef, Hubert Keller-- Fleur de Lys at the Mandalay Bay. Marital disclaimer: she did not ask to be taken to Fleur de Lys-- that was my idea. The room itself was surprisingly plain-- a tall room with curved, stone walls and long gray curtains hanging from the ceiling. Each table was set with attractive floral plates specially designed for the restaurant. We opted for the 4-course "Elegance" menu, and between us managed to sample almost everything on it. Dinner began with an an amuse bouche, which I think was the first amuse I've ever had. I had a tiny morsel of tempura cod over a smidge of puree (potato?) with a cayenne cream; my wife got a gluten-free candied beet with three dots of different beet vinaigrettes. A lovely bite to be sure, but... where did this whole amuse bouche thing come from? Could anything be more pretentious? A single bit of food, plated up to look attractive, but to tease your palate. If you enjoy it... tough, there's just that one bite. What a production that must be in the kitchen, to manufacture that single bite of food and present it just so. The bread basket offered four choices: challah twists, onion herb foccacia, whole wheat rolls, and pretzel rolls. I tried all but the foccacia over the course of the evening, and while all were fine, none were remarkable. Oddly, all were served chilled. The pretzel rolls were my favorite, but would have been even better served warm. And I've ranted about this before, but... what's the deal with chilled butter? These days just about the only time butter is brought to your table is with bread. The whole idea is to spread it. So why are you serving me a rock-hard slab of the stuff that I'll have to carefully shave with my knife and still tear up the bread as I apply it, instead of a soft, pliable pillow that glides effortless across the bread? 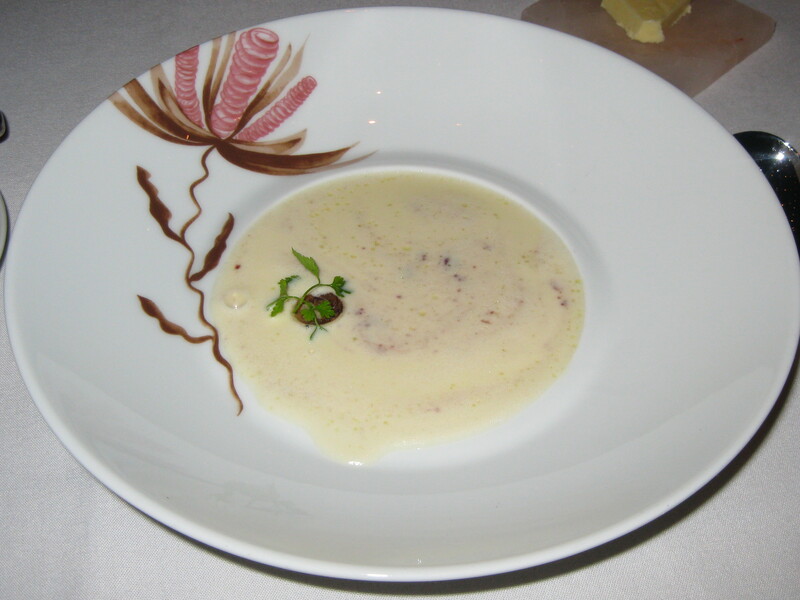 Our first course was a truffled cream of onion soup with a braised duck ragout crepe (I didn't bring a camera, so... Internet to the rescue!). The bowls were brought to the table with just the crepes, a single shaved truffle, and a swirl of red wine shallot puree at the bottom. The soup was then poured over, tableside. My wife is trying to eat gluten-free, so hers came without the crepe and mine came with an extra. I'm sure you have entirely the wrong image in your mind for the crepe. It was about the size of a Tootsie Roll or Jolly Rancher-- a ragout of duck bound together by a very thin crepe. The soup was delicious. We both agreed we could have swam in it. I'd expected something more like a French onion soup, but it was nothing of the kind. There was not a single onion in sight, but the flavor was unmistakable. The texture was smooth and velvety, and while my wife enjoyed hers, I certainly enjoyed mine more because I got to partake of the duck. Only for two spoonfuls, one per crepe, but those two bits elevated the dish to an entirely different level. Our server said this soup was their most-Yelped-about dish, and I can certainly understand why. Next, my wife had the salmon mi-cuit (partially cooked) in whole grain mustard sauce, which chef Keller had made in the dorm room episode of Top Chef Masters. 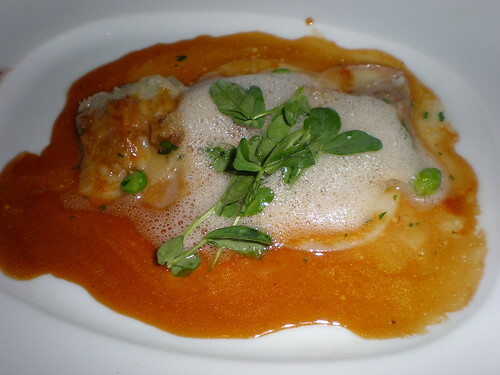 I had veal and Yukon Gold potato ravioli with sunchokes, pea shoots, and veal jus. That's a sunchoke foam atop the dish in the photo, and I now understand why so many people on Top Chef roll their eyes over foams. Does that look good to you? It's as if the Brundlefly predigested something atop my food. Aside from a bubbliness, it didn't impart much flavor. The ravioli were soft, but otherwise unremarkable. By far the best thing about this dish was the veal jus. I brought the bread guy back to the table so I could get something to sop up all that fabulous jus, and didn't let the server take the plate away until there was nothing soppable left. 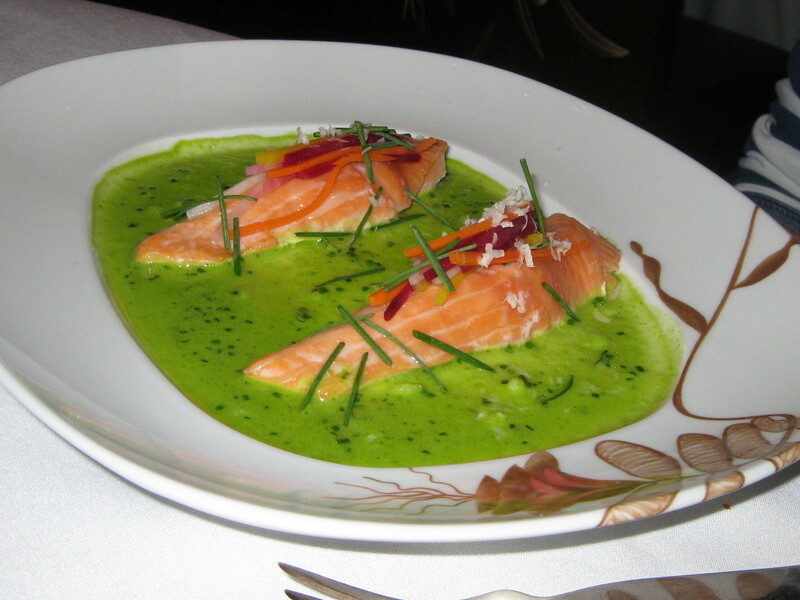 Wife's review of the salmon (her portion was half what is pictured): "Good, small, nothing spectacular. The sauce was nice." Next up were the highlights of the meal. 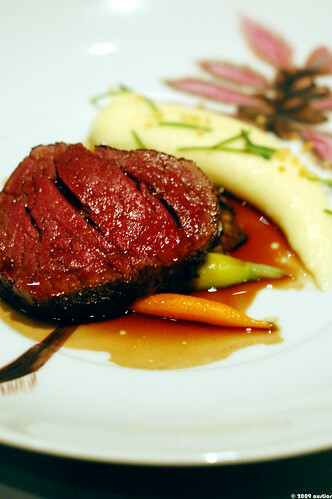 For my wife, a filet with potato puree, and for me, stout-braised beef short rib with root vegetable puree and stone-ground mustard, with a jus poured around the plate at the table. Wife: "Fantastic! Cooked to perfection, melt-in-your-mouth. Sauce was delicious, and the potatoes were wonderful-- smooth and creamy." As for me, I don't think I've ever had a better short rib. The meat was spectacularly fall-apart-with-a-fork tender, with just the right amount of fat distributed throughout the meat-- not fatty at all, but unctuous and gelatinous in a delightful way that lubricated every bite. The hint of mustard was just right. 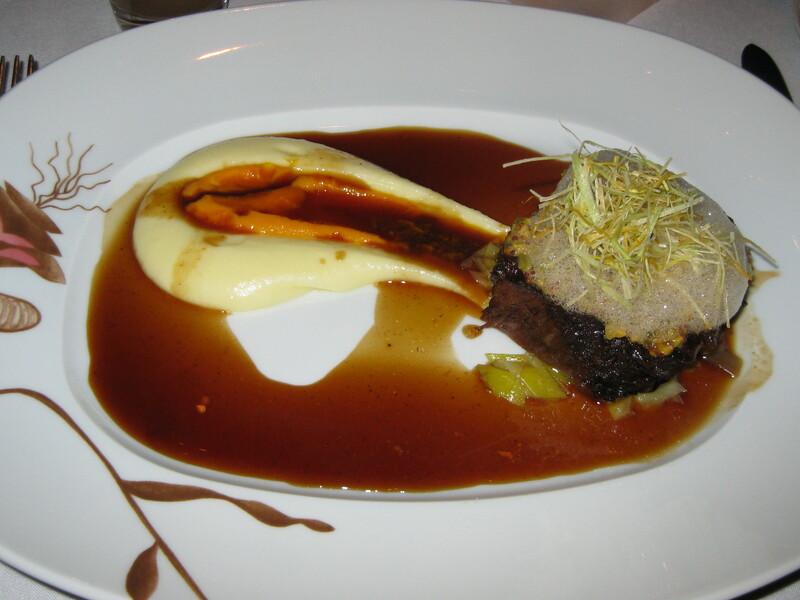 The puree, while smooth and creamy, was a mere supporting player-- the short rib was the unquestioned star. I just wish there had been more of it! 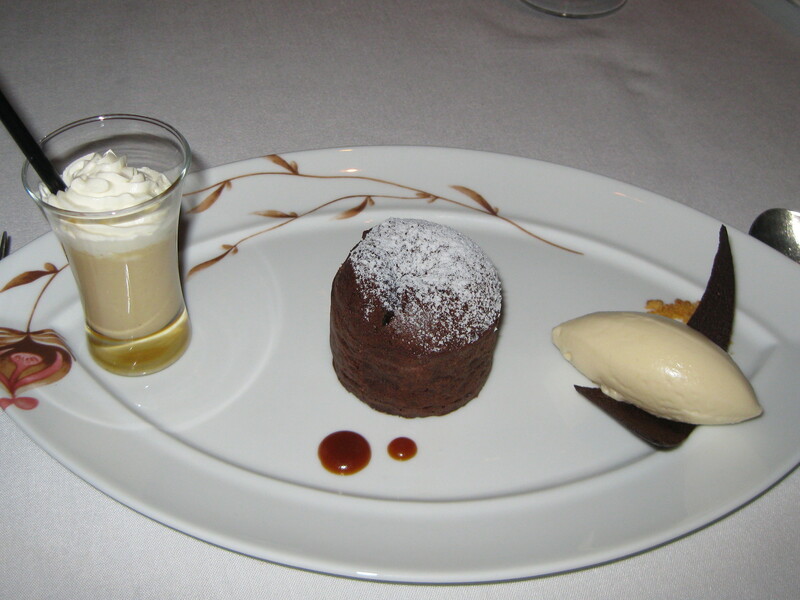 Dessert was merely OK. She had a quartet of fresh sorbets (blood orange being the standout), while I went with the warm chocolate fondant cake with popcorn ice cream and peanut butter milkshake. The cake did what it was supposed to do-- oozed warm chocolate when opened-- but the salted caramel center hinted at by the menu failed to show up on my palate. The popcorn ice cream was terrific-- think Crackerjack, not movie theater. I didn't expect to like the milkshake (not a fan of peanut butter in any form other than peanut butter) and I wasn't surprised, although my wife happily sucked down the remainder for me. A plate of 5 half-bite dessert morsels followed, including a fabulous peanut butter, chocolate, and graham cracker square that I'd have eagerly taken in a full brownie-sized bar. The menu was $89 a person, and our Restaurant.com $50 certificate (which wound up covering tax and tip, but nothing else) was greeted with cheerful enthusiasm. Service was terrific throughout the meal from all parties. My water glass was never empty, our server was a pleasant guide, and the kitchen was very accommodating with my wife's desire to go gluten-free. So was the $180 meal for two worth it? I'm not sure. Neither of us left the restaurant feeling full, but neither were we hungry. I would have loved to eat more (especially that short rib! ), but I certainily didn't need more. There were memorable dishes and some misses. 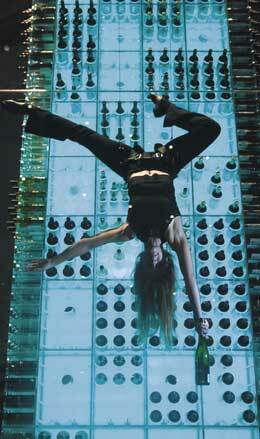 Service was efficient, pleasant, and unobtrusive (not that I need rappelling wine angels, mind you). We enjoyed ourselves and looked forward to each new dish. This is certainly not something I'd do on a regular basis. I think my expectations are too high. For the price, I expect to be not merely pleased, but wowed. Upscale dining may not be my scene. I'm just a value shopper. The meal I had at Poppy in Seattle last month was every bit as good as this one, and was more fun, less full of itself, and less expensive. I'm glad we went to Fleur de Lys. I'll even do it again somewhere else sometime, perhaps even this trip. But I'll take a great hole-in-the-wall over an overpriced celebrity chef any normal day of the week. A class action suit has been filed in New Jersey against Snapple, charging that the use of high-fructose corn syrup makes their claim of "all natural" false advertising. Deceptive advetising claims are everywhere these days-- perhaps the only thing more ubiquitous is high fructose corn syrup-- and I'm all for cracking the whip on corporations who engage in such practices. But only if the advertising in question is, um, false. High-fructose corn syrup is made from corn starch that is processed with enzymes to create glucose and fructose. Critics of the sweetener charge it is far from natural because of the multi-step process required to create it. Corn starch and enzymes. No chemicals, nothing unnatural. Critics are trying to attach guilt by association. The process used to create the syrup requires multiple steps, therefore the result is unnatural. And there is certainly a definition of "unnatural" that would support this. Could the syrup be created spontaneously in nature? If not, by one definition, it's unnatural. But I don't think that's the definition consumers would find most useful in this context. What we really want to know is whether or not there are chemical additives in our food. I don't care if bananas and kiwis grow in entirely different climates, such that they could never be in the same place "naturally". If you puree them with some ice, the resulting smoothie is still all-natural. Hell, if you liquified them and then whipped them into a stable foam (assuming such a thing were possible)-- a configuration nature probably never intended-- there's nothing culinarily "unnatural" about it. If you made a popsicle out of it by freezing it to absolute zero-- a condition impossible in nature and enabled only by modern technology-- is there anything in the final product that my body would find unnatural? If not, what's the hubbub? The FDA has no official definition of "natural", so the use of the term remains unregulated. High fructose corn syrup is evil, sure. But it isn't unnatural. If lawyers are really looking for someone to go after for false advertising, I have just five words for them. Fox News: Fair and Balanced. Last week the gf embarked on a new dietary regime designed to detox the body by eliminating potentially allergenic foods. Dairy? Gone. Wheat? Axed. 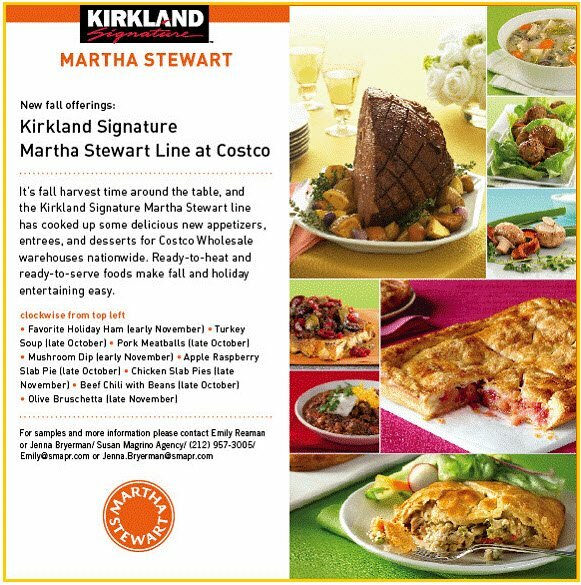 Shellfish and beef? Off the table. Citrus, tomatoes, potatoes and corn are also taboo. What's left? Chicken, fish, rice, lentils, and veggies. And since detoxing is a goal, eliminating chemicals and processed foods is also beneficial. Wanting to be supportive, I seized on this as an opportunity to try out a service I've long been curious about-- organic produce delivery. The service, from Pioneer Organics (wouldn't the title of this entry be a better name, battalions of Lucasfilm lawyers not withstanding? ), delivers a box of seasonal produce to your door every one or two weeks. The contents of the box changes each week depending on what's fresh, but you can ban things you don't like (we'll pass on the eggplants and lima beans, thanks) and you can vet the packing list beforehand every time and add or remove whatever you want. This goes with my belief that life should be delivered. I've never much cared if my produce was organic or not, so I'm very interested to see if I notice any difference in taste or quality. 1 Galia melon, 1 lb mixed baby new potatoes, 2 ears of white corn, 1 bunch broccoli, 1 bulb purple garlic, 1 mango, 1 Valencia orange, 2/3 lb Bing cherries, 2 lbs bananas, 1/4 lb salad mix, 1 bunch kale, 3/4 lb green grapes, 1 head Romaine lettuce. The potatoes, corn, and orange are earmarked for me since they're off-limits for the gf. I intend to eat the corn ASAP (likely Saturday) since its sugar quickly turns to starch causing the corn to lose flavor. We dipped into the cherries tonight and they're deliciously sweet. The Romaine is easily the fullest head of Romaine I've ever seen. It's screaming "Caesar salad" to me, but... egg. Parmesan. Not gf-friendly. Perhaps a different salad, or a Thai lettuce wrap recipe the gf dug up. I've never seen a Galia melon before-- it's about the size of a grapefruit, and I'm not sure if it's ripe yet. Since it has no odor, I'm inclined to wait a bit. I've never used kale in my life, so that's going to be a fun little adventure. In fact, having unfamiliar produce thrust upon us and being forced to figure out how to use it was part of the motivation for signing up with the service. So... the experiment is too early to call. I'm hoping that having the produce in the house will spur me to cook with it, and if that happens it's all to the good. And every other Thursday is going to feel a little bit like Christmas. With a granola-crunching, overall-clad Santa. Of all the fast food burger joints, the one I like most is Wendy's. Not necessarily because their burgers are better than their competitors', mind you, but for a number of factors combined. Their value menu has an excellent array of choices when you want something cheap, including the winning combination of a real, honest-to-goodness baked potato and a cup of acceptable chili (whose real, honest-to-goodness-ness I choose not to dwell on). Slice open potato, pour on chili, enjoy. They have both batter-fried and roasted chicken sandwich options. Most importantly, I like their fries-- thicker than Mickey D's or Burger Kings, less crispy, but heartier and less salty. Really, the only thing missing is dessert. I know lots of people who swoon over the Frosty, but chocolate dairy treats aren't my thing. I like dark chocolate, and any ice cream concoction will have more of a milk chocolate flavor. When it comes to shakes and the like, I'm a vanilla guy. Songs of praise for the Wendy's Frosty fall on deaf ears. So last night I found myself at a Wendy's, and a decal on the menu caught my attention: "Chocolate or Vanilla". I did a double-take. The Frosty machine stared back at me from behind the counter as it always did. It looked no different. It still had only one spout-- a spout that heretofore always dispensed a chocolate dairy treat. "Excuse me," I asked the cashier, "do you guys have Vanilla Frosties now?" She confirmed that they did, and so I ordered my first 99 cent Frosty-- dispensed as if by magic from the formerly chocolate-spewing machine. And you know what? Meh. It was basically a cup of vanilla soft-serve. A perfectly fine soft-serve, but too firm to be sucked down with a straw. Certainly nothing to replace McDonald's old hot caramel sundae-- I used to ask my dad to stop at the golden arches just for that. With extra caramel on the bottom, please. Ooooooh, yeah. But this? Nothing to get excited about whatsoever. Blizzard, your throne remains secure.